Photos courtesy of IDF Spokesperson. Like it or not, the Iran nuclear deal is done. In much of the Middle East, defense officials in many states believe that a sizeable proportion of the soon-to-be released $100 billion Iranian windfall will be directed toward funding proxy armies of the Islamic Republic, for whom the Jewish state remains the prime target. Israel's focus is now, more than ever, on defense and surveillance. In the north, Hizballah, Iran's proxy Lebanese army, remains a massive threat to regional stability, siding with Syria's disgraced President Bashar Assad and his saviors from Russia. In Gaza, it is no secret that a previous rift between Iran and Hamas has been smoothed over to further mutual objectives and that another, and possibly more brutal round of hostilities between Israel and Hamas may not be far away. "The sanctions relief and the nuclear deal with Iran represent a strategic shift that the IDF will have to tackle over the next decade," Israel Defense Forces (IDF) Chief of Staff Gadi Eizenkot said Monday in a speech at the INSS conference in Tel Aviv. "We also see [Iran's] attempt to influence Arab Israelis and those in the Gaza Strip, and the estimation is that as Iran's economic situation improves, over the next one-to-two years, it will divert considerably more resources into opposing Israel, via the Iranian military industry." Last week, the Investigative Project on Terrorism (IPT) saw first-hand the situation on Israel's south-western border, meeting with a senior IDF source who cannot be identified for security reasons. Close to the Kerem Shalom border crossing, where Israel oversees the transfer of many hundreds of tons of goods and supplies every day into Gaza, we scrambled up a sizeable sand dune that offered a panoramic view of the situation on the ground toward the closed Rafah crossing from Egypt into Gaza. "We hear the explosions and the fighting [against the Islamists] on the Egyptian side. The Egyptian army is taking it seriously," the senior IDF source explained as we looked across the triangular border junction and heard distant noises, apparently explosions. "We hear this every day. Terrorists continue to try to cross from Egypt into Gaza." Minutes later, a text message announced that the Keren Shalom crossing suddenly had been closed. It turned out that the Egyptian army reportedly engaged and killed 13 jihadists just a couple of miles away. Two days earlier, an attempt to breach the Israel-Gaza border fence and plant an IED resulted in an Israeli airstrike reportedly eliminating a member of the Al Aqsa Martyrs Brigade. Meanwhile, Hamas continues to test fire rockets into the sea, and in recent months other Islamic militants in Gaza sporadically lob rockets toward Israel. On the other side of the border triangle, Egypt is doing its best to keep a lid on ISIS and other Islamist forces in the Sinai Peninsula. It's clear that relations between the Israeli and Egyptian militaries are good, a dangerous common enemy helping to focus minds. Under President Abdel Fattah el-Sisi, Egypt (despite a lack of support from the United States), has taken the fight to the terror organizations, often at a significant cost in Egyptian military lives. The horrific October downing of the Russian passenger jet out of Sharm el-Sheikh brought the scale of the task facing Egypt into focus. 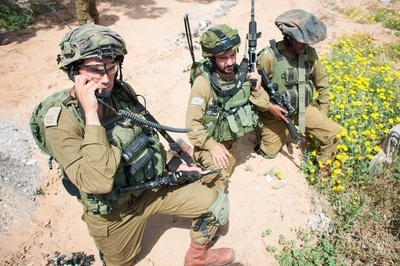 Israel remains alert for the jihadists turning their attention and firepower from Sinai, but for now believes that Gazan-based terror poses its most immediate threat. "It's been quite quiet with Hamas [since the 2014 Protective Edge war], but they don't keep quiet for long," the IDF source said. "We're not looking for a fight – we have an interest that there will be quiet here – but if we have to deal with Hamas, this time we'll deal with them properly." Many Israelis were dismayed when Israel unilaterally pulled out of Gaza in 2014 without a ceasefire, some criticism coming notably from members of the left-wing opposition and media for allowing Hamas off the hook when many believed it was in utter disarray. Now, despite ongoing attempts to stem the flow of weapons, reports suggest Hamas is rebuilding fast and may have some surprises in store for Israel if there's another round of fighting. "Look, we're quite certain they are still building tunnels," the official said, planting his heel in the sand and showing how easy it is to dig. "And yes, I'm sure they have new weapons – anti-tank, anti-aircraft etc. Like us, they will want to be better next time, but we understand more. The reality is different. We're learning all the time what is going in Gaza. The army is always preparing for the war to come and [Hamas] won't meet the same thing as in [Protective Edge]." 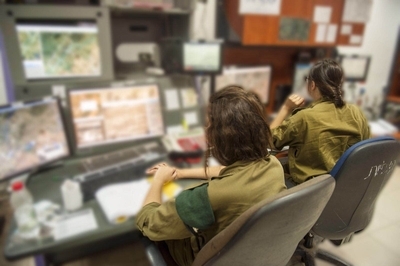 While Israeli soldiers and advanced technology such as its Guardium unmanned patrol vehicles are the first line of defense – the IDF indicated last year that the development of underground tunnel detection systems is also a priority project – the eyes of the military are actually in special units of female soldiers, known as the tazpitanyot. They monitor all movements, looking for suspicious activity, known terror operatives, and attempts to breach the border. They work in a series of non-descript trailers and shipping containers belying the fact that inside are massed banks of video screens and radar images, and the ability to combine pictures filmed from aerial blimps with other cameras – both day and night vision. This arrangement allows operatives to zoom in and see Gazans as far as a mile from the border fence. When anything, or anyone suspicious pops up, there are pictures of 'Wanted' terror suspects close to the screens. They instruct the on-the-ground forces to investigate. Never averting their gaze from the screen during a four-hour shift, each soldier has been trained to identify every landmark, tree, or rock within her specific area of surveillance. "If there's even a single branch missing from a tree, they'll spot it" the women's commanding officer said. They also have remote control of the machine guns sited on border watch towers. No security system is 100 percent foolproof, and during the first two weeks of the last round of fighting, four terror tunnels emerged on the Israeli side, only being detected at the last moment. In two cases, the IDF fought gun-battles leaving at least 10 terrorists and six Israeli soldiers dead. Hamas had hoped to kill civilians before luring Israeli soldiers back through the tunnels then kidnapping them or causing mass casualties. Methods and practices of surveillance are being continually reviewed, but no-one in the Israeli military doubts the tatzpitanyot's crucial front-line role in its border security, both north and south.